We’re smack dab in the middle of asparagus season, so chances are you’ll find a good deal at your local super market. As a kid I was never too fond of asparagus and I have a feeling I was not alone in this mindset. Of course as one matures so does one’s taste. In the end, I think it matters less what you’re cooking than it does how you’re cooking it. 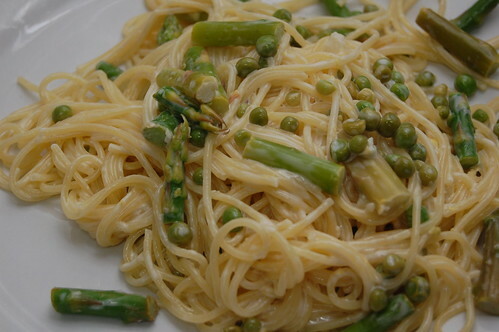 This is a quick simple dish for a hungry person in spring. The garlic is faint, the lemon works will with the cream, and peas are a nice complment. I enjoyed it. Boil your pasta in salted water as per the packages instructions. Steam your asparagus until tender (3-5 minutes for thin, 6-8 for thick) and immediately submerge in ice cold water to stop cooking. While your pasta is cooking, reduce your wine and lemon juice in a large pan under medium-high for 2-3 minutes. Lower the heat to medium and add butter, salt and garlic and cook for 3 minutes. Garlic should be fragrant. Add the heavy cream and continue to cook, reducing, for an additional 10 minutes. 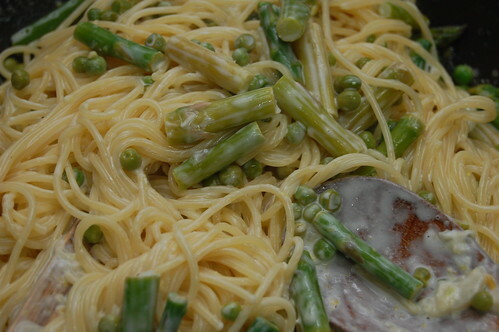 Add the asparagus, pasta and peas and toss to coat. Enjoy.